The number of crimes in Scotland involving hunting with dogs has more than doubled over the past year. The Wildlife Crime In Scotland report revealed 44 such crimes were recorded in 2015-16 compared with 20 the previous year. 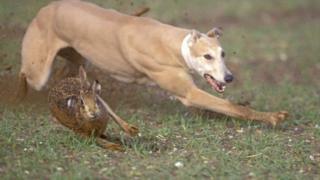 The largest proportion of those crimes - which could include hare coursing and fox hunting - are in the north east. Overall, wildlife crime has fallen year-on-year from 284 recorded incidents in 2014/15 to 261 last year. Fish poaching was the most common wildlife crime with 75 incidents. But that is a reduction on 101 the previous year. The biggest hotspot for wildlife crime was in Tayside, where 53 crimes were reported, followed by the north east with 41 and the Highlands and Islands with 33. Of the 90 cases passed to prosecutors, 23 led to prosecutions, of which 16 resulted in convictions. Conviction rates have fallen year-on-year since 2013/14. A Crown Office spokesman said: "The Crown takes the prosecution of wildlife crime extremely seriously. "Careful consideration is given to any reports of alleged criminal conduct which are submitted by the police, or any specialist reporting agency. "Prosecutorial action will be taken if the reports contain sufficient evidence of a crime and, if it is appropriate, and in the public interest to do so." He added: "The specialist prosecutors of the Wildlife and Environment Crime Unit (WECU) work closely with police wildlife crime officers and other specialist reporting agencies from an early stage to ensure that cases are prepared and presented to the highest standard." The Scottish Gamekeepers Association is hoping to work with the government on a review of grouse shooting. A spokesman said: "As a body we have a strict code regarding wildlife crime which is fully understood by our membership. "The SGA advocates and seeks only legal and adaptive solutions to resolving species conflicts. "We note the Scottish government's intention to hold a review of grouse shooting in Scotland and will participate fully in what we hope will deliver sound evidence and not implication or speculation." The Scottish Wildlife Trust believes the real figures are higher than the official numbers suggest. Director of conservation, Susan Davies, said: "It's likely the overall figures significantly under-represent the actual number taking place, due to the difficulty of detecting incidents that often occur in remote, rural areas of Scotland. "Wildlife crime comes in many forms, from uprooting plants to baiting badgers or hare coursing, to poisoning or persecuting raptors and damage to protected sites. These crimes are unacceptable in modern Scotland, and it's vital that a broad range of tools are deployed to combat them." Environment Secretary Roseanna Cunningham said: "I am pleased to see an 8% reduction in the overall number of offences for the period 2015-16 compared to 2014-15, down from 284 to 261. "Fish poaching remains the highest volume wildlife crime, but it has also seen a significant 26% reduction in offences, down from 101 offences in 2014-15 to 75 in 2015-16. "This is a welcome sign and testament to the partnership work of Police Scotland, Fisheries Management Scotland and District Salmon Fisheries Boards. "Conversely, it is disappointing to note an increase in hunting with dogs offences. A total of 44 offences is an increase of 24 offences on the previous year and the highest number over the five-year recording period."